It is always interesting when a guitar sneaks up on you. I was visiting my local Long & McQuade to pick up some new Elixirs and hung out in the acoustic room for a few moments playing this and that. I played a nice SJ200 Bob Dylan and a very nice Songwriter. Nothing equalled any of my acoustics so as I turned to make my way out, I saw the back of a guitar that was out on the floor on a stand. I could see it was a Gibson 12 string with gold tuners. My spidey senses perked up. 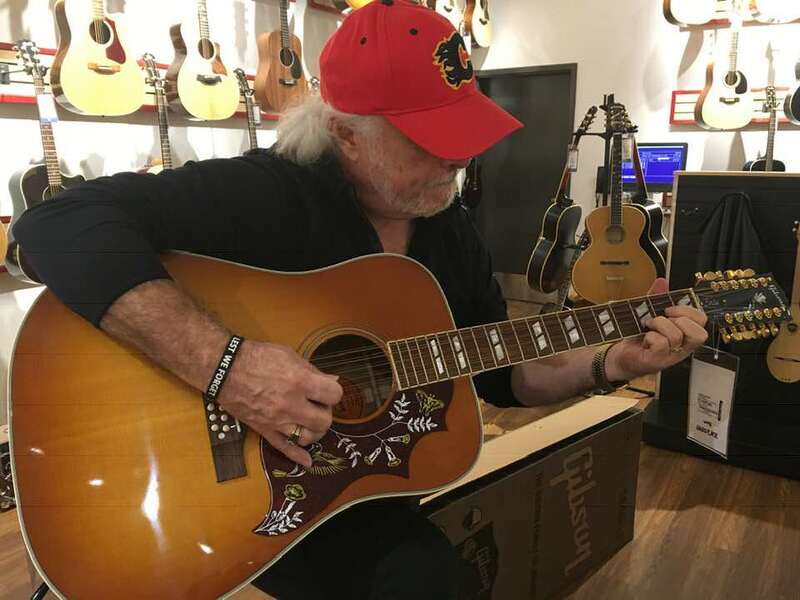 The last time I saw a Gibson 12 string in the store was at least two years ago and it was a Songwriter 12. This one had a Custom Shop logo on the back. "What's this??" I murmured to myself and pulled it out of the stand to face me. It was a 2014 Hummingbird 12 string Limited Edition in Heritage Cherry Burst. I have it on a three-day evaluation loan. I don't like the strings on it and will change them out for a set of Elixirs tomorrow and then A/B the Hummingbird with my Taylor GA3-12. I can get some pretty good money for my Taylor on a trade. I think I'll record a video of my A/B tests both plugged in and acoustically. The guitar was set up by the excellent guitar tech at L&M Calgary and plays like a dream. I'm absolutely sure I don't NEED this guitar. My Taylor is just fine as a 12 string acoustic. 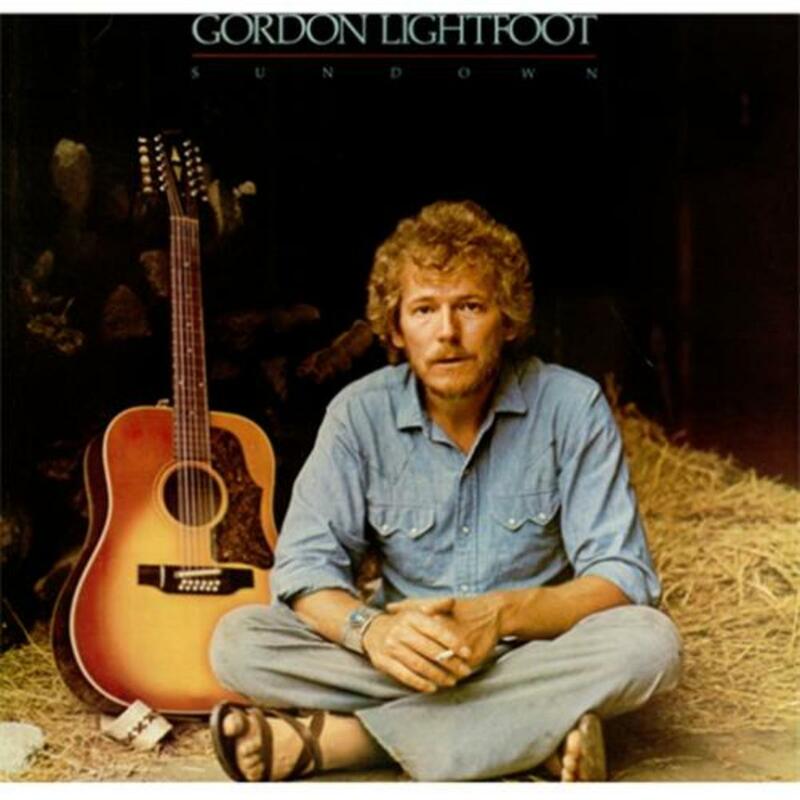 BUT, since I was 14 I had admired Gordon Lightfoot's guitar. At 14 I had no idea it was even a 12 string or, in fact, that 12 strings were even a thing. So when I saw my first Gibson Hummingbird six string in 1977, I bought it. Long story - it was crap. Of course, years later I discover that Mr Lightfoot's 12 string is a B-45. I've never seen one of those in person. So this Hummingbird 12 in Heritage Cherry Burst is the closest thing I've ever seen to Gord's B-45. I had an early 1963 B45-12 which, based on the top binding and the strange (at least for the early 1960s) square white paper label, a recycled Hummingbird body with a tailpiece, wide neck and humongous headstock. I now, thanks to Cabarone, play a slope shoulder 1961 B45-12. Not real jangly sounding but a whole lot of spank and honk. I have never played a Bozeman-made 12 string. Nor have I ever had anything to do with Taylors. But Cabarone makes a very good point. 1960s Gibson B45-12s may just be the most undervalued "vintage" guitars out there. Sometimes it is worth the wait while the hunt is always fun. But in the end, it will come down to whether you want (need has nothing to do with it) two 12 strings. I do not so will stick with what I have. 1. When was the last year of B45 12 string production? 2. Have there been limited or special edition Custom Shop runs of the B45 12 string out of Bozeman? 3. Why do some B45 12’s have trapeze tail pieces and some don’t? 4. I’ve seen Bozeman build the Hummingbird, J200 and Songwriter as 12 strings. Are there other styles they’ve made into 12’ers? I’m off to string this puppy up. "The B-45-12, a 12-string edition guitar introduced in 1961, was the first B-45 model guitar available and the first B series overall. The B-45-12 had a mahogany body and neck, spruce top, rosewood fingerboard, and a cherry sunburst finish, and was made with "round" shoulders for the 1961 – 1962 model year and "square" shoulders until the end of its production in 1979. Starting in 1963, the B-45-12-N was also available as a natural finish edition. From 1991 – 1992, Gibson manufactured a reissue of the B-45-12 with rosewood sides and back"
The trapeze tailpiece came on later models. Don't know if both were ever available at the same time. I wouldn't think they were. There's a Dove 12'er model as well. Sometimes. The trapeze tail bridge was an effort by Gibson to take some of the pressure of 12 strings off the top of the guitar in hopes of preventing tops from caving in on the B-45, a problem with many of the Gibson 12 strings from the 60’s which were inherently under braced in their original designs. That guitar looks like it was made for you! If you have the funds for it and would trade a Taylor in toward it, why not?!?! I do not know about Bozeman but the Gibson Custom Shop was making one of kind B45-12s by 1962. The first B45-12s had trapeze tailpieces. Gibson then began moved around between tailpiece/fixed bridge setups (with the size of the fixed bridge varying) and pin bridges. You need a scorecard to keep up with what they used in any given year. My '61 and early '63 were built with tailpieces. A '64 I once took home for a test drive had a pin ridge. Thing is it took Gibson a couple of years to figure out how to make a 12 string on which the top did not cave in. I believe the lightly built early guitars though fared better with the tailpiece which may have been Gibson's initial reasoning. I have a 2005 Hummingbird 12...without wanting to add fuel to the GAS fire, it’s the best 12er I’ve played by a mile. I’d been searching for the right 12 for a long time, and forumer JohnT came up trumps with this one, which he cut me a fantastic deal on. I’ve toured with it and it’s all over my next record. As far as 12 strings go, this is it for me for life. Also on the hunt for a 12 string.. but it wont be a Gibson..... Or a taylor. I just don't think I will use it enough tot justify the hefty price tags. It would be interesting to look at the innards of a Bozeman-built 12 such as this 'bird, and compare it with the innards of a standard modern six-string 'bird. I suspect the fatal flaw with early Kalamazoo 12's may have been the result of using the same top bracing used in the six-string versions of the guitar. Essentially increasing string tension by well over 50% must have put the structure of those early 12's to the test. A lot of them failed. They sounded great while they lasted. People often kept those in standard tuning, rather than tuning down and capo-ing up when playing as part of a group working in standard tuning. The Guild 12's in that period were pretty much built like tanks. As I said Gibson, nor in fact Martin, appears to have known how to adequately brace a 12 string guitar. You have to remember the only U.S. Company even offering a stock 12 string in the 1950s was Harmony. When Guild came out with their first 12 strings I think around 1963 they showed everyone else the way. One of the easiest ways to tell if it is an earlier light braced 12 string is to look at the slit diamond on the headstock. Those on earlier guitars have rounded tips while those on the doodads of later heavier braced guitars are much sharper. 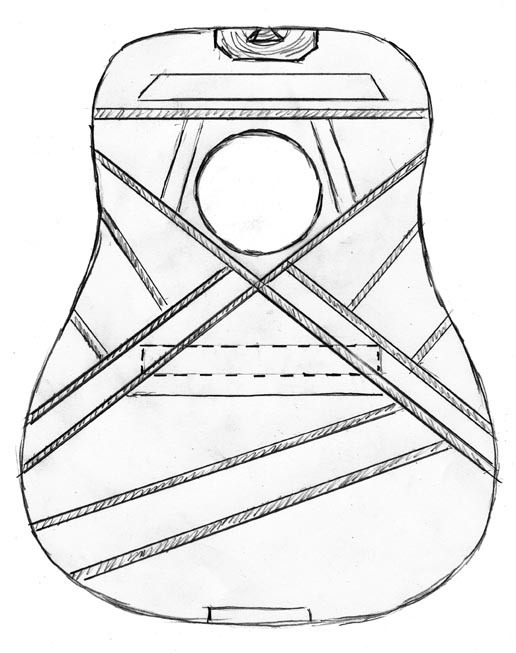 Here is a sketch of the bracing footprint of a post-1964 Gibson B45-12. Note that the Gibson doubled up on the X brace below the soundhole. Gibson and Harmony both use to include warnings with the 12 strings to keep them tuned down. I just completed changing the strings on the Hummingbird 12 and I've recorded audio and video of an A/B test of the two guitars. It will take me a while to compile the YouTube video but I played both guitars strumming and flatpicking open, capo 2 (Drop D) and Capo 5. I put each sequence on different tracks so I was able to solo each track in succession to listen back and forth between the Bird and the Taylor playing the exact same passage with the exact same strings and the same mic placement. There are no effects or tone adjustments. My first impression of the recorded audio is that the Gibson has a wider frequency response right across the guitar's spectrum. It is brighter and louder and clearer than the Taylor, and I've enjoyed playing, recording and listening to the Taylor for years! The Bird looks nicer, plays about the same (they are both setup beautifully), and feels lighter in my hands. The neck is shallower but it still feels fine in my hands. I haven't tried out the pickup yet. It is a UST LRBaggs. It really isn't important because if I like the Hummingbird acoustically, then the right pickup to capture that sound can be acquired. If I remove the UST, it will just make the Bird sound better IMO. So, so far, it looks like I will be doing a trade on Thursday. I'll probably just play the Bird a lot tomorrow just to play in the new strings more. So here is my comparison video of the Gibson Hummingbird 12 string versus my Taylor GA3e 12 string. I read the serial number wrong in my original post. It is, in fact, a 2017 model Hummingbird 12 string in Heritage Cherry Burst. It has an LR Baggs VTC under-saddle pickup. I think I've made up my mind. What do you think? They both sound wonderful, in all honesty! The Taylor is very punchy and focused and the Hummingbird is very big and dramatic sounding, to my ears. Personally, I think the Hummingbird shades it. The strings on the Bird sound like they’ll come in beautifully after a few more days of picking, whereas the Taylor sounds like it’s wearing older strings already. Pretty much my thoughts as well. The Taylor sounded great until you played the 'bird. After that, the Taylor sounded fairly thin, while the 'bird was fuller across the spectrum. What a wonderful voice that 'bird has! Someone will be very happy with the Taylor but you're not going to miss it. Rich and beautiful that Gibson is indeed. You have a trained ear, my friend! That is precisely what I hear. The strings on the Taylor were about to be changed but I put the new Elixirs on the Hummingbird instead. I like the wide, dramatic, big sound of the Hummingbird. It is precisely what a 12 string should be. The Taylor is what it is, a $1000 12 string made by one of the best 12 string makers in the business. Someone is going to get a bargain. They've put it on the wall today at L&M for $800 Cdn. I don't expect it will last long.